This is something of a mandatory donation meter. If you don’t feed it with coins it sounds a very loud alarm continuously. 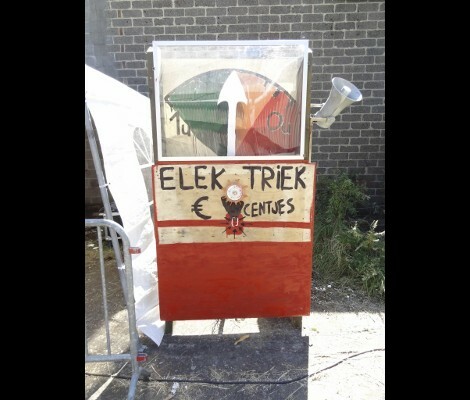 [Piet De Vaere] built the device for a free festival in Ghent, Belgium. The intent is to help raise awareness that although free of an admission price, the success of the event depends on donations. It works much like a parking meter. When you feed it coins time is added to the meter. When it runs all the way down that large loudspeaker on the right side of the case sounds the alarm. In the video after the break [Piet] walks us through a demonstration, followed by a tour of the hardware. The pointer on the meter is a piece of cardboard connected to a servo. An Arduino board controls the servo, adding time in two-minute intervals whenever a coin enters the chute and passes by an optical sensor. There is no distinction between types of coins. The use of a pizza box as a prototyping board shows that you don’t have to be fancy to build something neat. Absolutely brilliant – love it! Or in this case, makes noise. Less donation, more protection racket. but what pray tell is to prevent me from donating a sledgehammer upside that thing…..
Because about the second time it went off it would be a coin flip between that and reporting it as a disturbance of the peace. And like a mook I got to about “This is something of a mandatory donation meter. If you don’t feed it with coins it sounds a very loud alarm continuously.” and figured someone had set this up randomly in a city. that’s actually a neat idea. i should make a modified version of the concept and use it at ‘free – donations welcome’ renegade/rave parties, and instead of an alarm, wire it to a relay box that connects the sound and lights systems. no dough? no show.. and then when not keeping the rave going, i’ll set it up in the livingroom for when everyone wants to come lan at my place. a nice improvement would be to use a real coin and bill mechs. to keep and display a running tally of donations received, and maybe at the break-even point, the box disarms itself , but kindly continues to ask for more donations. It wouldn’t read bills, but how about one of those “piggy banks” that keep track of the coins put through their slot? Cheap and hopefully one could tap into the lines that feed the LCD display. I think they just measure the size of the coin put in them. Cool idea, but it could get obnoxious. Somehow I think “being obnoxious” is most of the point. It wouldn’t get obnoxious if everyone puts in at leats a coin or two. This sounds almost as annoying as those Salvation Army Santas that run up to you and purposely ring their bell TWO INCHES FROM YOUR FREAKIN’ EAR when you’re entering or leaving a store. I will happily donate to a good cause; but do not, as a rule, encourage annoyance with reward. So they’ve never gotten one cent from me, through their Santas or otherwise. I also dream of causing a few Santas grievous bodily harm, though the probable result of assault charges stops me. But that does NOT extend to electronic annoyances. Enough is enough already. I carry a stun gun and a wire extender, that when covertly applied to the right area, typically solves such problems. A few motion-sensitive ad players in stores with their volume set to “startle” have died prematurely. And should any festival I go to have the poor taste to set up such an annoyance, it too will suffer an untimely end. Not saying it didn’t happen to you, but I’ve *never* experienced Salvation Army bell ringers ringing close to my ear, or anything even remotely like that. I’m not connected with them in any way, but I’m sure they’d want to know if any of their bell ringers were making a nuisance of themselves. Enter your zip code at http://www.salvationarmyusa.org for a contact to complain next time it happens. You could add two laser optical sensors, one that would only see coins as tall as a quarter, half dollar, or dollar. And another that would see the small coins, small only adds 1 minute. If they really want to make money for the festival hook this thing up to the portapotties, they’ll make a fortune!